The Missouri Mavericks hockey team has only been playing for two seasons, so there aren’t a lot of championship banners hanging above their home rink at the Independence Events Center. But doesn’t mean the rafters are empty. Scores of black sound baffles drape from the ceiling and dozens more hang perpendicularly around the seating perimeter. They’re all part of the design to make the arena’s music sound better. 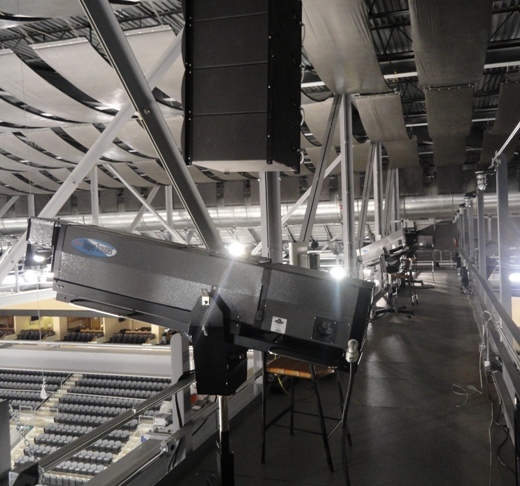 The catwalk high above the arena floor provides a unique look at the sound baffles strategically hung from the ceiling. Based on those findings, strategically placed ceiling baffles were hung and wood-fiber panels were placed along the walls at the back of the seating level. When Fray pops Sting’s greatest hits into the arena’s sound system the playback is crisp and clear, as if it is being played in a giant living room. 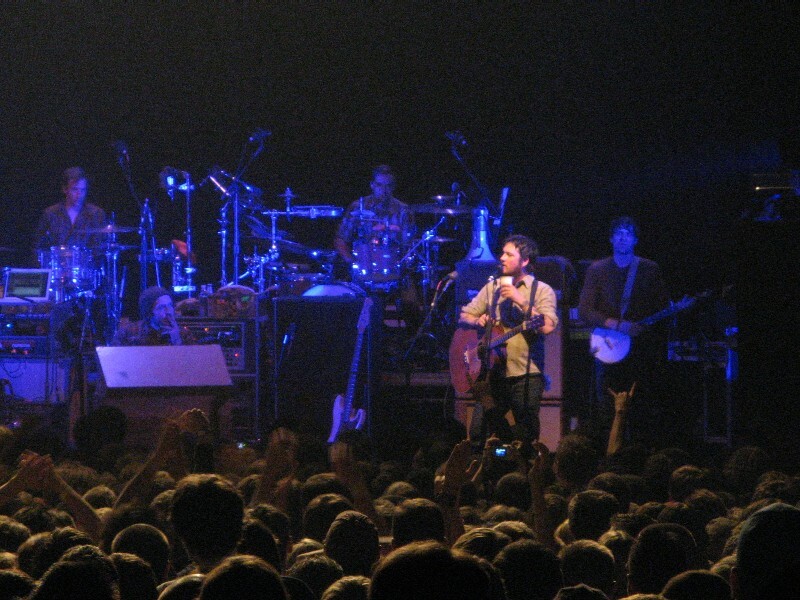 When the Events Center hosts concerts, the act brings their own sound engineer and equipment. Their sound system is run through a separate power transformer devoted solely to audio equipment. This, Fray said, eliminates the hum that often arises when the transformer is shared with the lighting rigs. “A guy from the Zac Brown Band crew told me we had more power available for them here than when he worked on the crew for the Bon Jovi show at Giants Stadium,” Fray said. Fray said when he mixes he tries to visualize the sound as a 3D image, with the vocals in front and the guitars, bass and drums filling out the space behind. When an instrument solo occurs he moves that to the front of the mix. 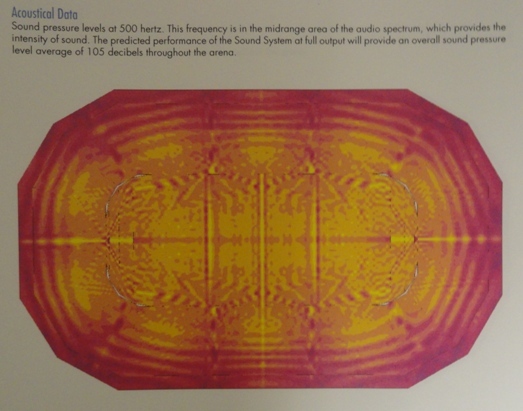 Audio engineers used 3D sound captures like the one above to gage how different frequencies would react in the room. A well-engineered room offers more forgiveness to the sound crew. That’s good news for music fans on a couple levels. Not only will they be able to better enjoy the show while it happens, but it means there’s a good chance the performers will come back and fans will be able to live the moment all over again. Friday’s concert was barely 15 minutes old when Alice Cooper was forced under the guillotine. The crime was impaling a roadie and the sold out Ameristar Casino crowd was witnesses to his guilt. From the guillotine to the hangman’s noose to the iron maiden, Cooper’s Theater of Death definitely lived up to its name. More than a rock concert, the 90-minute spectacle was a brutal slab of rock theater set to a heavy soundtrack. Backed by a tight, thunderous four-piece band, Cooper both opened and closed the show with “School’s Out.” In between he hit on nearly every phase of his massive back catalog. Flipping from blues-based hard rock to industrial metal, Cooper and co. did a good job unearthing album tracks and delivering the hits. The only time the group dialed down from 11 were the back-to-back acoustic numbers “Only Women Bleed” and “I Never Cry.” Cooper delivered “Bleed” with a lifeless Rozetta across his lap and “Cry” hanging from the gallows. The setting rendered the ballads less tender but more powerful. Cooper uses props in the same way as the Flaming Lips. The added spectacle definitely makes the evening more entertaining, but would be worthless without the great music supporting them. Cooper’s band drove this point the two times they were given the stage alone. Deprived of their leader and all his tricks, they rocked hard and kept the audience riveted. After an instrumental number, Cooper returned with some of his biggest numbers. It was hilarious to watch the group of graying mid-life dudes in the crowd go nuts over the silver Mardi Gras beads he tossed out during “Dirty Diamonds.” For the next number – “Billion Dollar Babies” – he presented a saber loaded with fake money, which was sprinkled over the front rows. The main set ended with the one-two punch of “No More Mr. Nice Guy” and “Under My Wheels.” Although they’d been played to death, the band was clearly having a blast, duckwalking backward across the stage and grinning from ear to ear. It was hard to tell who was having more fun, the band or the crowd. Ultimately it didn’t matter. It was clear both sides lived for this stuff.